If you were following my blog last year you may remember the Christmas Cottage I had made from one of two houses I had bought for $1 each at Liquidation World . Well as promised I said that I would make a Haunted House this year for Halloween from the house that was left. I made a 'beware' sign from broken Popsicle sticks which I painted and hot glued together. I also made the little pumpkins out of felt (tutorial coming soon). 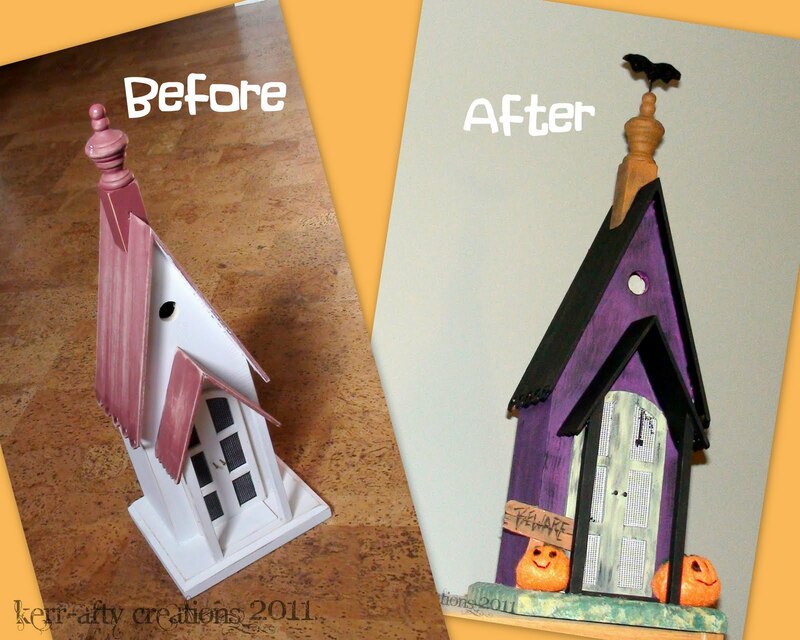 I wanted to incorporate a bat somehow and decided to put him on the very top, coming out of the chimney/steeple?...I decided to hammer in a small nail which I then painted black and hot glued two felt pieces (cut out in a bat shape) together with the nail in between. ...and there you have it my cute but spooky Haunted House. This is a fantastic transformation! I’d love for you to link up to my Wickedly Creative Halloween Ideas Party. Oh, my! This is "spooktacular", Justine! Those little pumpkins are A*D*O*R*A*B*L*E, and I love the bat on the spire! (Kinda reminds me of a bat weather vane). Wish I had a Liquidation World store close by! Meant to say "input", not "imput" - good grief! great idea! turned out super super cute!!! !